BY 2015, GLOBAL settlement patterns are projected to cross a threshold where, for the first time in human history, the majority of people will be urban dwellers. By 2025, cities are expected to contain approximately 6 billion people—two-thirds of the world’s population. 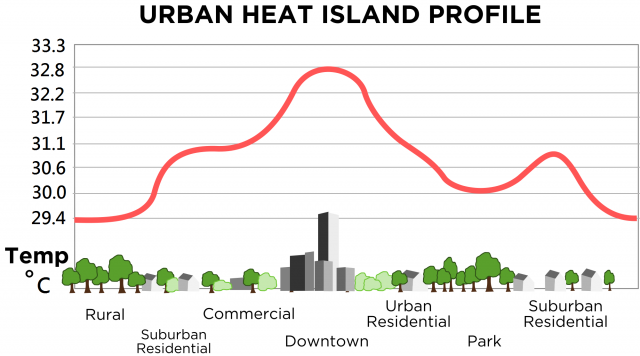 This unprecedented expansion of the number, size, and population of urban areas will have a significant impact on urban climates and is expected to exacerbate the phenomenon known as the urban heat island (UHI). The urban heat island is a temperature anomaly where an urban area is characterized as an island of warmer air amidst a rural sea of cooler temperatures. First recorded nearly 200 years ago when chemist Luke Howard observed temperatures to be warmer in the center of LONDON, England, than in its surrounding countryside, the intensity of the urban heat island has notably increased as cities have grown in size and population. By dramatically altering the Earth’s landscape, urbanization creates distinctive climates characterized by higher air temperatures. Large urban areas are already 6 to 8 degrees F (3.3 to 4.4 degrees C) warmer than their surroundings, and the heat island effect is projected to double in many rapidly growing cities within the next 50 years. Among the numerous causal agents of the urban heat island effect are increased anthropogenic heat from such urban activity as manufacturing, transportation, and lighting; increased emissions of atmospheric pollutants; and the displacement of natural vegetation in favor of urban construction materials with greater heat absorption capacity. By storing large amounts of solar energy during the day and then emitting this stored heat back into the atmosphere throughout the nighttime, urban structures contribute substantially to the urban heat island effect. Consequently, it is during the night that the heat island effect is most pronounced. In fact, the daytime urban-rural temperature difference tends to be relatively insignificant. In addition to the built environment, meteorological conditions such as cloud cover, wind speed, and precipitation also influence the UHI. The clear skies and weak winds of a stationary high-pressure system are associated with maximum heat island intensity. A typical urban heat island under these conditions of maximum intensity is associated with three distinct characteristics: a cliff, a plateau, and a peak. The cliff is found at the rural-urban border and is highlighted by a steep temperature differential. The plateau represents the region of gradual temperature increase throughout the urban area. The peak is typically found at the urban center and is identified as the point of maximum temperature. Temperature measurements for the UHI may be taken either at or near the Earth’s surface. Increased near-surface temperatures that exist beneath roof levels, analogous to plant canopies, are identified as the canopy-layer heat island. Measured at the microscale, this urban canopy layer (UCL) combines individual elements of the natural and built environments, including trees and houses, to create climatic variation in small geographic units, such as streetscapes. A combination of several similar streetscapes, as well as the elements between them, forms a local-scale climate that rises above roof level. The eventual merger of individual local-scale climates creates the urban boundary layer for the entire city, which is measured at the mesoscale. At each successive scale, the urban heat island is magnified, as are concerns over its effects. In addition to numerous hydrological and ecological impacts, the UHI effect can reduce human comfort levels and increase heat-related sicknesses. While the heat island may be viewed as beneficial by reducing the need for heating in cold climate cities, in most places these savings are outweighed by the need for summertime cooling. Not only does air conditioning have higher energy requirements, but the act of running the air conditioner emits heat into air already warmed by the heat island effect. The design and construction of the built environment have increased the temperature of the urban climate. Ameliorative strategies are now required to alleviate the urban heat island effect. While no city has as yet initiated a comprehensive program aimed at mitigating the effect of the heat island, several “cool communities” strategies are being implemented. Tangible steps being advocated include the roofing and paving of urban areas in lighter colors to reduce heat absorption; the cultivation of small gardens at set distances from each other; and the planting of a well-distributed canopy of shade trees on streets and property lots. Urban design strategies aimed at restricting suburban development through the establishment of urban growth boundaries and promoting infill development and high-density construction are also being advanced. All of these remedial steps are intended to improve the thermal efficiency of an urban area and thereby reduce the urban heat island effect.